thankyou amy,yes,ive already spread the message to the younger folks as most dont know about this event.its not being widely publicized.i just accidentally found it while researching him and the bill. i plan to create an instant flashmob if possible ,for shock and awe effect if possible.kinda push the message home i hope.about an hour ahead of time.have the kids all call each other to remind.when i say kids i mean the twenty somethings.they are the most networked around here.so hopefully it will be a big gathering. i just got pdf from pwm,i think? first page that popped up was triboelectrification.lmao. me and pwm are on the same thought pattern. sorry pwm,that was a pdf i havent read.im still trying to find flux. im worried the nsa may be messing with us.grr. ive been thinking lately.a mercury vapor coil may be a better solenoid than a sc magnet. a mercury vapor igniter could be put in the end of the coils.the current could be controlled with just a knob.this would be lighter than a sc magnet i think. im not changing the design of this one.just thinking out loud. the charge would come from van de graaf generators.mounted on a platform.maybe four.two negative two positive. maybe a small 3 hp generator. i dont even need van de graafs.i could just use a bank of ignition coils.10,000 volts is all i need.how to get it to cycle at right frequency?i forgot.lol.im thinking 70 htz.any theories? between that and a mercury vapor coil .i think i could build a one person craft.200lbs for passenger,100lbs for generator and 100 lbs for iron tubing.maybe 300 lbs for fiberglass saucer.coil would be mounted on ceramic standoffs on outer edge of craft. thankyou amy.here is my cropped screenshot,way lower quality. i highly recommend amy for art work.she has two hours invested in modifying it.what a wonderful woman. im so proud of this updated and modified image.its two years of work to discover the true functions and missing parts. this is a mhd motor and mhd generator combined into one machine.with no moving parts. i have not found any patent that comes even close to this design. ive checked into patenting it but cant afford the fees. Yeah, gotta have money to make money. LOL! Well, patents will be pointless in TAP. Inventors will earn prestige for what They do and no tech will be hidden for profit/control motive. open source is the future.then a patent will hold very little value. Well, I don't see it so much as "open source" per se - though public coding will be selected from open-source code - but more, if You hide it, Your work will go unnoticed and You will earn no status, recognition, lauds, thanks, appreciation, fame, or any other social currency. Only in sharing One's creation will One earn anything. So being open is promoted while being closed is not. over the blackhole issue.heres another article. this was the debate that started it all. this guy ill call ovaltech gave me the original image.i sent him the updated/modified design .he was very impressed and agreed that he thought i had it.he went on to give me some hints about how it worked and i replied that i agreed with his thoughts.he originally didnt understand the function either until he saw my design. Just checking in, lots to think about, as usual. It's a great design Robo, i take it you want to pre-charge the top terminal in some way? Go for it. What would also help is maybe insulation at the bottom, and cooling fins on the 2 outer pipes, the faster it can cool, the faster it will flow, just my 2 cents. Yep, i remember the Hawking episode LOL i never accepted his theory anyway. Gamma & X-rays escape black holes. They are just photons, travelling at the (variable) velocity C, the same as light. Now, these guys even admit by their own logic that photons have no mass (yet they can turn a vane in a vacuum tube (Crooke's radiometer)...which definitely indicates some mass component. So if they have no mass, what is stopping them, surely not GRAVITY, which ONLY affects mass, but electric charge is indeed massless........will catch up on this thread later, bye for now. It has been suggested that a Flux-liner is capable of beyond lightspeed, that would not surprise me. I am also combining this with the Lifter research; we are laughed at on other forums because 'lifters' are just ion wind & are considered passe & not relevant. Silicon valley tech is now within our grasp; think Barium coated Kaplon, gold-plated carbon wires, AlCu alloys, spray-on Vfets, batteries, thermal tiles, led's.al of this is now possible. There's a vid out there of a lifter in a vacuum - works splendidly... And a couple of vids of the disc experiment ala TT Brown with the discs encased in resin, eliminating ion wind. Works splendidly too. Looking forward to Your results and the future in general. i was just thinking about the radiometer yesterday.thats creepy. that things in a vacuum so its not convection that spins it. yes the cooling fins may be something i can do. no i will not be pre charging but that may be something i consider.i expect the iron plumbbob triboelectricity to charge it. ive still got the taser if need be. all it has to do is create uv and that max's out at 10kvdc. i have not studied the gravity waves or gravitons issues but if its true then yes the fluxliner should be able to do ftl. thankyou amy,i didnt ķnow about vids showing lifters in a vacuum.if you come across one,please post it on this thread. most shills say it doesnt work but i think thats high vacuum not low vacuum. i personally believe that size of lifter and voltage determine how well a lifter works in a vacuum. i may be totally off on this idea. 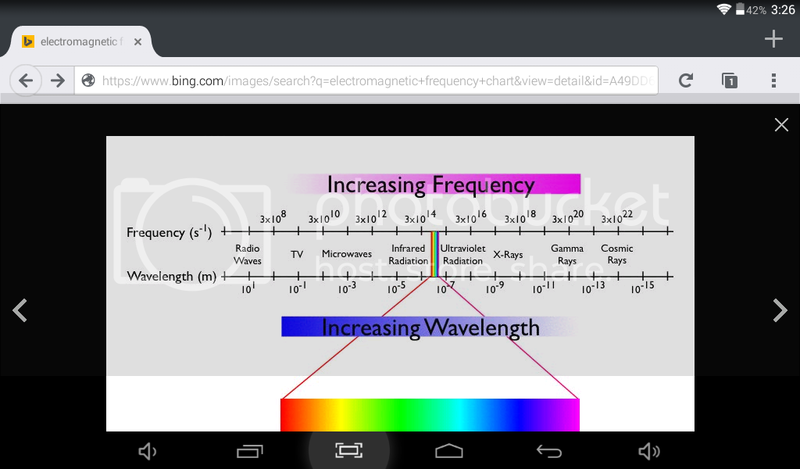 look at the frequency of light and then multiply times 64.
tesla was the frequency master.maybe he was on to something! if ftl is true then the universe becomes almost frozen as far as travel goes.not as much accuracy would be needed to traverse space. this got me thinking about electrons orbiting.if the centrigal forces from frequency became too high,the electron could escape its orbit.at a right angle.just like xrays come off at a right angle.hmm? I just have so much info that still needs checking out, it seems there are as many ways of getting about as there are of generating electricity. We can't get element 115 around here, let alone Thorium, so i will go for the one that's easiest & cheapest to build. Even then there are several to choose from. thankyou amy.so the next time some"expert"says lifters dont work in a vacuum.i can pull up these vids. 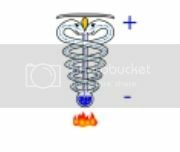 keshe is sharp.no bs,i think he borrowed some of my ideas but i have used his ideas to back up my theories.i think he was hanging out at glp or ats about seven years ago.just not going by keshe.by then i already had my blackhole theory but not the caduceus idea. i was planted in the just the charge theory back then.we had some good debates at ats about antigravity. so word to the wise.follow keshe and his current theories.